1 cup chopped dates/1 cup boiling water/2 Tbl. butter/1 tsp. baking (bread)soda/1 cup dark brown sugar/2eggs/1 1/2 cups sifted self-raising flour. Soak dates and butter in boiling water. Let sit until dates are soft and butter is melted. Cream sugar and eggs. Add baking soda and flour. Mix well. Butter and flour 10 small muffin cups. Pour in batter. Bake for about 15 minutes at 350F or 180C. 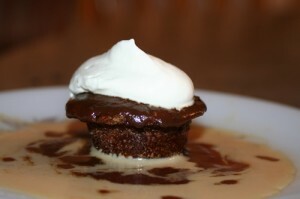 Combine 1 cup dark brown sugar, 1 cup light cream, 1 tsp. vanilla extract and 2 Tbl. butter. Bring to the boiling point, turn heat down and let simmer for 5 minutes. While still warm, place a cake on plate, drizzle with toffe sauce. Add a jigger of Irish Cream on the plate and a dollop of whipped cream on top. Nothing better!